Thanks for all the comments about my latest Innocent Crush quilt. I had several requests for measurements, so I’ve put together a quick tutorial showing how to make up the block that makes up this quilt. This block is a great one for using fat quarters, and I think it works best with non-directional prints, since the blocks end up turned in many different directions when you put together the quilt top. For my Innocent Crush quilt, I used fat quarters of 11 different prints (all the prints from the Charmed palette). 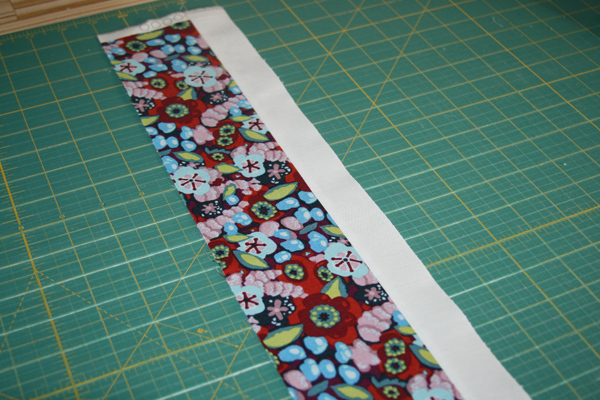 To start, square up the long edge of one of your fat quarters and cut a strip 3.25″ wide. You’ll want to cut this strip along the long side of the fat quarter, which means you’ll have a length of approximately 22″. Cut a strip of solid white (or your solid of choice) that’s 1.5″ wide and the same length as your printed strip (in this case, about 22″). Sew the white strip to the long side of the printed fabric and iron. Cut this strip into 7″ pieces. You’ll get 3 pieces from each strip. Repeat with your other printed fabrics. 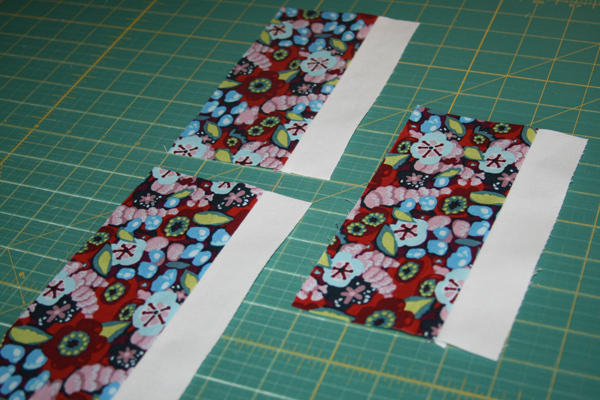 Additionally, cut a second strip from each printed fabric that’s also 3.25″ wide (3.25″ x 22″). Subcut into 3.25″ squares. While you’re at it, cut additional strips of white fabric 1.5″ wide by 3.25″ in length. 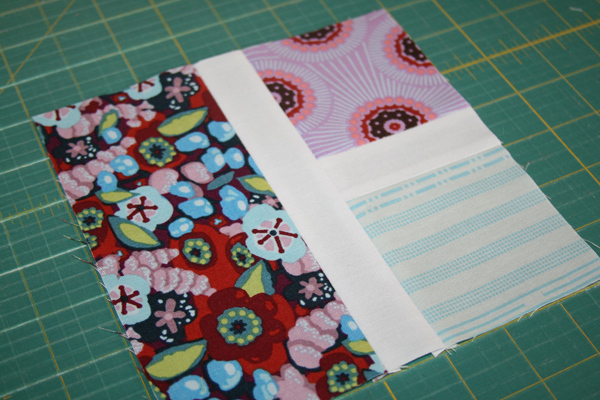 Select two printed squares and sew together with a white strip separating them. Iron seams. Sew this section to your rectangular section and iron your seam. Your block will measure 7″ square. As always, let me know if you have any questions, and if you make a quilt or quilt blocks from this tutorial, please consider adding your photos to the FITF Flickr group! 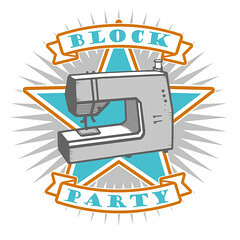 This entry was posted in Tutorials and tagged innocent crush, quilt, quilt block, quilt block tutorial, rectangle squared, tutorial. Bookmark the permalink. Love this quilt. Thanks so much for sharing the tutorial! Thank you, I love this pattern. I can not wait to finish yhe quilt i’ve started. This will be definitely my next project.. Thanks for the tutorial!! I’ll definitely be making a quilt using this block. This one is definitely on the To Do List. It looks like it should go fast. Oh thank you! I *literally* dreamt about trying to make this quilt after I saw it the other day (although in my dream there were all kinds of other crazy things going on too). I love the look of your quilt and can’t wait to give it a try. Thanks so much Ashley, this is fab. This layout is such a nice way to ‘feature’ a fabric line, each fabric getting it’s own spotlit frame, if you know what I mean. Thank you! Thank you! Thank you!!! For giving a tutorial!! This is a stunning quilt! I love it and now I’m sure to make one someday!!! Love it! Thanks so much. I’ve been looking for a new project using fat quarters. Anyone have yardage requirements for a full size quilt in this block? ooh, thanks so much for the tutorial! love this quilt pattern! I’ve been wanting something different and this is it! Thank you! This is one of those quilts that inspired love at first sight for me … I’ve returned to your original post over and over again and am thrilled with your tutorial. I can’t wait to give this one a try! What is the size of your block when you are done? I’m trying to draw this out and I’m just not getting it. It’s such a beautiful quilt!!!! I love your work! I think I’ve got it figured out! LOL! 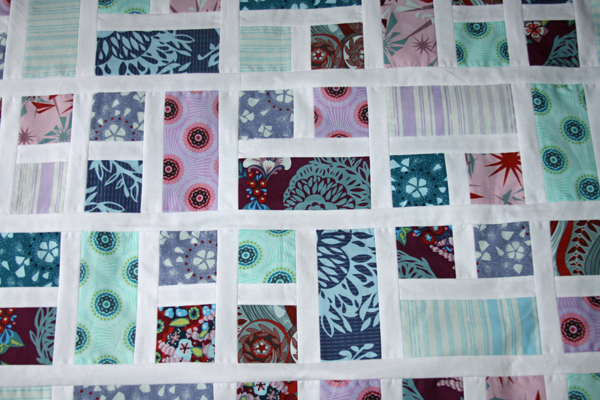 I love how just changing up the orientation of a block can make such an interesting quilt. Thanks for the pattern! Thanks so much for sharing this! I hope that I can make one of these in the near future. Thanks for the tutorial!! I think I’m going make this with Parisville when it comes out. I read a lot of quilting blogs, but yours is my favorite! Thanks so much for posting the details! I’ve been hoarding a stack of Good Folks FQs, and now I finally know what to do with them. Love the quilt top— what are your plans for quilting it? i really love this pattern thank you so much for sharing the tutorial! Brilliant thanks soo much for tutorial, I would have made such hard work of it! Hi thanks for the great tut. I have some pre-cut Japanese fabrics that are 4″ and wondered what to do with them – I bought cream for the sashing and have some navy, brown and burgundy meterage that fits in with the pre-cuts. I have started cutting and will show you when it is finished. Thanks for giving the kick up the backside to get sewing again. I have too much going on and was stressing about it – I needed to sew so the stress went or lessens a little. Thanks for taking the time to write up these great and easy to understand tutorials. And you choice of fabric and color is, as usual, divine! Thank you so much for posting this. I really love this quilt! Adding it to my never-ending list. No Way! It’s really just that easy? This one will be made eventually. Thanks for the fab pattern Ashley. I just might have found the pattern for my Dream On fat quarter pack. thanks so much for sharing your lovely quilt pattern. Such an amazing result for such a ‘simple’ block! Thanks – I am cutting my fabric right now. I don’t know who will get this quilt. Thanks so much for the measurements! I’m starting my rectangles squared quilt today!!! 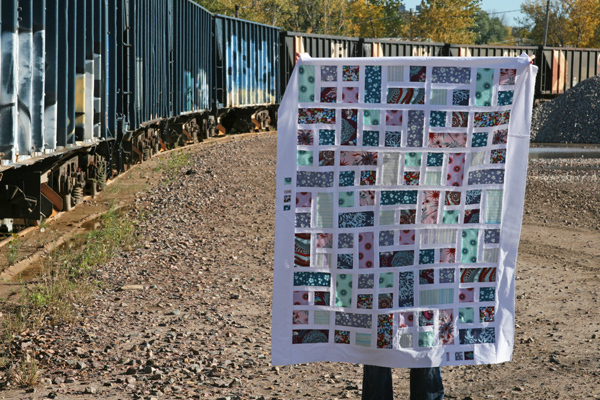 You are a quilting and blogging inspiration! Thanks. Here’s a link to pictures of my finished quilt!! It was a blast! Thanks again. Love the quilt. My hubby was happy to know he is not the only man that has to hold up quilts. I am absolutely in love with this quilt, and have decided it will be my next project. I love the symmetry, I love the white sashing – it’s all just gorgeous. Thanks so much for providing the dimensions. I really can’t wait to start this one! This is awesome! I am selecting fabrics to make one now! I will post pics in the Flickr group. Thanks! This is SO STINKIN’ CUTE!!! I can’t wait to make it!! Thank you for sharing! I love this quilt pattern. Several ladies from our church are making lap quilts for people taking kemo treatments. This is a good pattern for the quilts. I love the quilt…and wanted a cute pattern for my granddaughter’s first quilt…but, am I crazy? Are the measurements correct in the drawing? I can’t make it work, in my head…some of the sizes HAVE to be for before they are sewn, and some for after???? Please straighten me out, so I won’t look too old and out of it, to my gd! thanks for nice ideas, btw. The measurements are correct, and take into account a 1/4″ seam allowance. This should result in a 7″ square block when complete. So Brenda is correct? The rectangle says 7″, when it should say 7 1/2″? No, the measurements shown are correct. Real nice, and a great scrap eradicator! This is so me! Quick & easy, I have a gigantic stash of childrens prints (I have 6 grandchildren between the ages of 10 –> 6) and this design is uncomplicated. Your choice of colours are great as well. I trust you will have years of enjoyment with this beautiful quilt!! Thankyou so much for sharing your lovely quilt & tutorial with us all. Love this quilt! Can’t wait to get started using my stash! I think this would be stunning using 30’s fabric! Thanks so much for sharing! Love it; thank you so much for sharing. It looks complicated and you simplified for us. Ahhhhhhh, Help! First, thanks for the tutorial!! Now, for my exasperation…I found a blog site from a lady from Michigan who was doing one of these quilts. I loved the colors she had chosen. She had photos taking in her sewing room and in this sewing room she had large patio doors or large windows behind her sewing area. After seeing this blog and wanting to save it –MY COMPUTER CRASHED. Ugh! Are one of you posters this woman from Michigan? If you are, can you please email me with your blogsite? Making the sign of the cross…Thank you! Beautiful quilt!! I’m so excited to get started on this! The 1.5″ sashing is the cut size, resulting in a 1″ finished sashing, right? Also, how wide are your white borders? I’m guessing 5″?? Thanks! Love, Love, Love this quilt!!!! Your are so generous to share it with the quilting world! I really love this quilt. Thanks so much for the tutorial. I have some fabric that I have been holding on to, waiting for inspiration to strike. This is it! Thanks. How many yards of sashing fabric did you use? I’m going to make this in A Stitch in Color with gray sashing. So excited! Thank you so much for sharing this, I have just made my very first quilt ever using it and I am very pleased with how it has turned out. 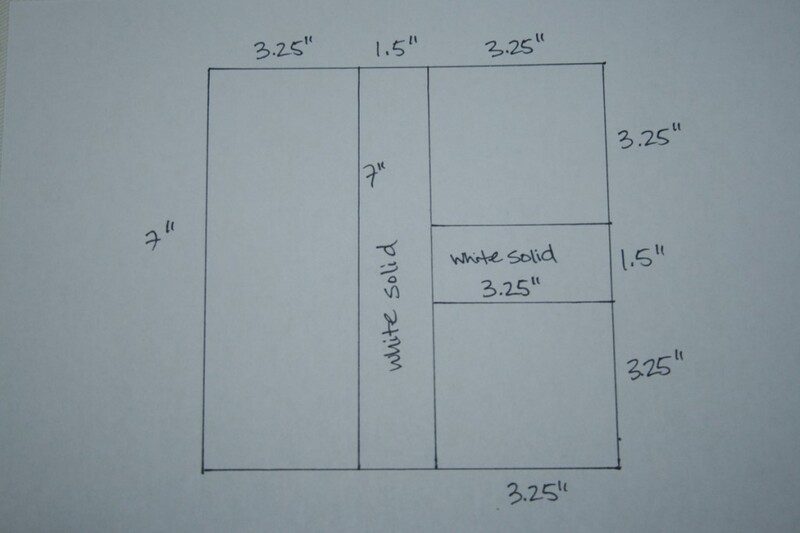 Ashley, I’m mapping out a plan for my upcoming Rectangle Squared quilt, and I’m a little confused about the measurements in your diagram. You say the block will be 7×7. But I’m getting that 3.25 + 3.25 + 1.5 = 8. Am I not accounting for the seam allowance? Or is there something I’m missing? I see this math issue as well. the long strip says 7″ so that means with a 1/4 seam , it would end 6.5 inches long and the two square blocks add up to 8 inches. Can you clarify what the dimentions are for each block and clarify it this is the cut size or the finished size? thanks far a pretty design. So, the measurements shown for each section are the CUTTING measurements, not the finished measurements for each section of the block; is that correct? It’s a really cool quilt that I would love to tackle. Still not sure about your measurements. 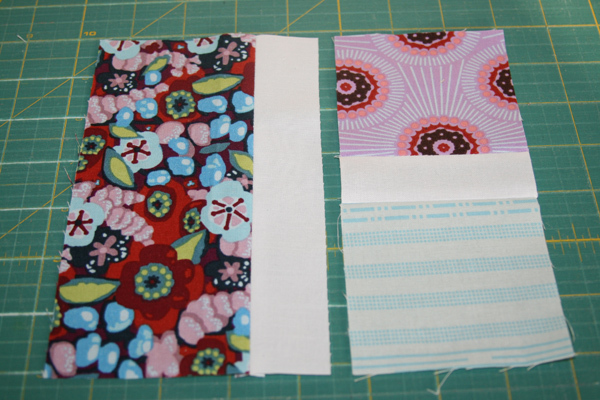 For a finished block (sewn into a quilt) you need to cut 7½” x 3½” rectangles, 7½” x 1½” white strips, 3½”x 3½” squares. When making your statement above to Laureen and Michelle you have not taken into account the seam allowance around the edges of the block. I am keen to make this as well and thank you for the pattern and I have just noticed these responses and the blog post are now three years old. The unfinished block is 7″, and the measurements shown above for each of the pieces are the cutting measurements. Can you tell me about how much solid you used for your quilt top? I LOVE this quilt. Thanks so much for the information. I MUST make one. You’re so generous to supply the tutorial. I was going to ask if there was a pattern available. Thanks again. 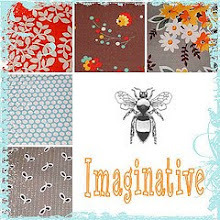 I have 18 fatts of Bonnie & Camille’s last fabric line, Modern something calling my name – any idea how much white is needed? can anyone email me with the fabric requirements for a large kingsize quilt I’m talking 108 X 115. Love this and it looks so easy! Thank you for the pattern to this quilt. It is going to make a great present. LOVE it. If hadn’t of been for the competition I never would have seen your quilt. I am so happy that I looked and voted because your quilt is my favorite of EVERYTHING. I even had the pattern saved on my Pinterest board and now I am so going to order a load of white fabric to make this. I sure have enough stash to do this. I am going to try this out! How much white fabric did you need for this? I am thinking of buying 2 yards just in case. I just finished quilting a wedding gift and used your awesome tutorial for it. It was a WIP for over a year now. Just binding to go! I Just started to make it, I love it! I love it, I just started to make it! I too love this. Looks complicated but…as long as you “pay attention” to 1/4″ seams there is not a place where you have to match-up corners. Thanks for the lovely detailed tutorial, with pictures, which made it easy. I’m a beginning quilter but have looked at quilts, quilt books, and magazines for at least 30 years. I hand quilt but am a newby at piecing. I LOVE IT ALL, even the hard parts. Thank you for sharing Stephanie. I am working on the same pattern- hopefully big enough for a queen-sized bed- with various animal prints. Thank you for sharing! I was planning to do a quilt for my grandson’s graduation. I saw one similar to this but no pattern. My friend found this and sent it to me. I’m going to make it with several different University of Texas prints, use black solid between the pieces and put an orange border on it! The measurements are for the unfinished block, which means they already include the seam allowances. The measurements are correct. Ann, how much is it off by? Is it the three pièces that you sewed together that are shorter than the two longer strips? If so, even if you use a quarter inch foot, it doesn’t mean you are actually sewing one quarter depending on your needle position. Measure your seam and look at where it is on the ruler. If it may simply be just slightly on the outside. You have to aim to do a scant quarter seam, so you want your stitches to be just a tad Inside of the quarter inch mark on your ruler. You can do this by adjusting your needle position. Google scant quarter seam and you can find a bunch of tutorials on the subject. If you’ve only done one block, you can test this out. If you’ve already done a bunch of them and don’t want to unpick them, or that this is not the issue, you can sew your blocks together and then trim them all square. It will just make your quilt top a little smaller. If you really wanted it bigger, you can just add a border on the outside to make it bigger. Thanks for the compliment! If you’ve done several of them, you’ll be fine as long as you are consistent with those three pieces. Then you can just trim all of them up when you are done. I’m not a fan of trimming up, but it pretty much always makes blocks so much nicer to sew together! What is the finished size of the quilt and how much backing is required? Oops, the one above is the wrong one for here. Kindra, you can make it any size you want. Just take the finished block measurements and calculate how much you need. If yougoogle standard quilt measurements, you can easily figure out what size you would like to make. There are also some calculators on line that can help you measure how much fabric you need. I have never quilted before. Is this a good starter quilt? I’m a beginner sewing also. I’ve never made a quilt before and have looked at a lot of videos to get an idea of what’s involved. I must say that your tutorial was the easiest to understand. And the resulting quilt is great looking. Thank you. Thank you. I have been looking for a quilt for my grandson , I think this will be great. Merci pour le partage, cela me donne vraiment envie d’en faire une ! Joli travail. Just discovered this fabulous quilt! Love it! Think it might make a QAYG!